The morning of the USA Memory Championship event will feature a Qualifying round of four events that will culminate with the top 8 MAs advancing to the Championship Round in the afternoon as well as the crowning of a USA Memory Championship Team. The afternoon event features the Championship round that will determine the USA National Memory Champion. Please note that all MAs will compete in all four Qualifying events. Raw Scores for individual events will be calculated into Championship Points utilizing a Bell Curve and will be rounded to two decimal places. After all four events, the top EIGHT (8) scoring MAs will advance to the Championship Round. Please note that scoring for the Team Competition will be calculated as an average of member’s scores and then converted to Championship Points utilizing a Bell Curve and will be rounded to two decimal places. The team with the highest Championship Points after all four events will be named as 2019 USA Memory Team Champions. Mental athletes will have 15 minutes to memorize 135 color photos of different people (head and shoulder shots as demonstrated above) with a first and second name written below each picture. Once the memorization period is over, competitors are then given 20 minutes for recall. Mental athletes are given the same photos again but without the names and in a different order to that on the memorization sheet. A point is awarded for every correctly spelled name, either first or last. No points are awarded for phonetic spellings. No more than TWO names may be presented for recall per image. Mental Athletes will have 5 minutes to memorize a list of computer-generated numbers which are presented in rows of 20 digits with 25 rows per page. Competitors MUST start with the first digit in the first row and continue with consecutive rows. Skipping rows is not permitted. Once a row is skipped, scoring will stop. Once the memorization period is over, the Mental Athletes will have 10 minutes for recall. There are 2 trials for this event and the best score is awarded. 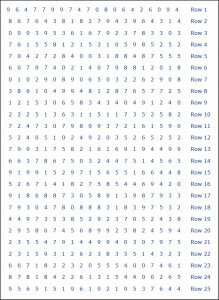 20 points are awarded for every complete row that is correctly recalled in order. For every completed row of 20 that has any mistakes will score 0 points. For the final row completed, scoring is done a bit differently. If the final row is partially complete but all of the digits are correct, then the points awarded will equal the number of digits recalled. The object of SPEED CARDS is to commit to memory and recall a single pack of 52 playing cards in the shortest possible time. There are two trials for this event and the best score is awarded. Mental Athletes will have 5 minutes to memorize a freshly shuffled pack of 52 playing cards. For those Mental Athletes who expect to memorize the complete pack in less than 5 minutes, a judge is nearby with a stopwatch to record the precise moment memorization stopped. The recall will take place once the entire 5 minute memorization period is complete. Once the memorization period is over, the Mental Athletes will have 5 minutes for recall. After the memorizing phase, everybody gets a second stack of cards which is in perfect order (i.e. diamonds 2, diamonds 3, diamonds 4 ….. etc.). Now this second stack of cards has to be put in the same sequence as the just memorized one. After the recall phase, both stacks will be put beside each other on the table with the card on the top where the checking should start from. Now the Judge will compare each card from the memorized stack with each card on the recall stack being at the same position. If there is a discrepancy then only the cards to this point will be counted. The Mental Athlete who recalls all 52 cards with the shortest memorization time wins the event. If no one correctly recalls an entire pack, one point per card CORRECTLY RECALLED IN SEQUENCE will be awarded. The first mistake made ends scoring. The best score from the two attempts will count. There are chasms, cracks, and cliffs up ahead. They are walking, slowly, closer to me. They’re here to help me on my journey. Are the friends I have made along the way. And shout words of encouragement. Are all of the mistakes I have made on the way. I have learned something from each one of them. And I will not look nor turn back. But I know what my ultimate goal is. I am ready for the journey. And my feet pound against the ground. I am beaten, bruised, and bloodied. And I’ve lost some companions along the way. They were not ready to face this. My chest heaves up and down. But I refuse to give in; I refuse to back down from this. I will come out of this stronger than I ever was before. I can see a faint, shimmering light in the distance. And reach for that beacon of Hope. And I see that some of my friends have left me. But most of them are still here. They were the ones who held true to my values. Mental Athletes will have 15 minutes to memorize a previously unpublished poem. Once the memorization period is over, the Mental Athletes will have 20 minutes for recall. Competitors MUST recall the poem from the beginning by writing it down exactly as it was written (the title and author also score). Mental Athletes must also make it clear where one line ends and other line starts as well as indicate where lines were omitted from their recall. A maximum of 2 consecutive omitted lines is allowed. Each of the three events will be conducted in a round-robin style tournament commencing with all of the finalists. Three(3) MAs will be eliminated during the first event, three (3) during the second and one (1) during the third to crown the USA Champion. Please review each event for detailed information. Eight Mental Athletes (MAs) will have 15 minutes to memorize a list of 200 words organized numerically in five columns with 20 words per column (2 pages). MAs must start at the first word of column 1 and remember as many of the words as possible. The word list is comprised of concrete nouns, abstract nouns, adjectives and verbs. Once the memorization period is over, the MAs will be ordered by their selection due to qualifying event rankings to begin the oral recall of words. Recall will begin with the first word in the first column and continue consecutively. Each MA will be allowed up to 15 seconds to answer. The first 3 MAs who either identify the incorrect word or fail to recall a word is immediately eliminated. Five Mental Athletes (MAs) will have 15 minutes to hear and review facts about 6 different people. The information will include name, date of birth, where they live, phone number, pet, favorite three hobbies, favorite car, and favorite three foods. The information will be presented to the MAs both orally and in written format. Once the retention period is over, the MAs will be randomly selected and ordered to begin the oral recall of information. Each of the six people will be brought back, but in a different order than they appeared. The announcer will then instruct MAs to begin with the first piece of information and continue consecutively. Each MA will be allowed no more than 15 seconds to answer. All pieces of information presented must be correct as well as complete (i.e. date of birth must include correct month, date and year). Each MA will be allowed 3 incorrect or incomplete answers before being eliminated. The first 3 MAs with three errors each will be eliminated. The remaining two Mental Athletes (MAs) will compete in the final event: 5 minutes to memorize 2 decks of 52 playing cards. All MAs will have identical decks of cards, previously arranged in the same exact order. The decks of cards will not be mixed and will have different colored backs to distinguish them. The order of memorization AND recall (top to bottom or vice versa) will be determined PRIOR TO MEMORIZATION beginning. Once the memorization period is over, the MAs will have a 2-minute hiatus prior to the beginning recall. MAs will be randomly ordered prior to the beginning of the recall period. Each MA will be allowed no more than 15 seconds to answer. After the MA calls the card, the Judge will flip the card in the master deck to determine if the MA is correct. The first MA to make a mistake is eliminated. The remaining MA is crowned as the USA Memory Champion. For more details on scoring, see the scoring page. The USA Memory Championship is an Olympiad for ‘thinking’ games. Set up as a sporting event for Mental Athletes, the tournament consists of memory challenging tournament-style competitive events including memorization of 126 names and faces, a shuffled deck of cards, an unpublished poem, and speed numbers. Mental Athletes compete for gold, silver and bronze awards in individual competitions. The top Mental Athletes from these events will advance to the Championship Round to compete for the title of USA Memory Champion. The USA National Memory Championship was introduced by Tony Dottino, President of Dottino Consulting Group, Inc., in 1997. While applying neuroscience to pragmatic applications in the business world, Tony was amazed that most people are unaware of the amazing potential of their own brain. As he discussed their “unlimited and amazing brain” he discovered that most were deathly afraid to talk about the subject, especially as it related to memory. Their number one concern: as you get older, you lose your memory. Tony set out to educate people, both professionally and personally that, “Your brain is like a muscle. Exercise it! When given the proper training, it gets stronger, regardless of age!” While attending a business seminar, the speaker suggested that you do something unique to get your message across, like conduct the first competition of something. As timing would have it, Tony Buzan had been talking about a local event he conducted in an English Pub where people competed with each other to demonstrate their memory. The links and connections between the “two Tonys” got going and the 1st USA Memory Championship was held. The rest, as they say, is history. United States of America citizen as supported by official government-issued documents such as a state notarized birth certificate with a photo ID or USA issued passport. Spectators are invited and welcome to attend the event at no charge. At this time the event will not be broadcast on television or the internet.